Many people are fascinated by ancient Greek mythology, which can be seen by the numerous volumes about the subject and various works of fantasy fiction that make their way onto the big screen. Although it appears that few if any people still believe in what were called gods and goddesses of Greece, that culture is still represented in today's Western world. Some jaspers say that the Bible is just mythology, like the Greeks, Romans, and others had. I wonder if they've ever read the mythologies and seriously read the Bible. When I was younger, I thought maybe they were just representatives of principles, but no, people did worship them. Those tinhorns in mythology were capricious, petty, deceitful, cannibalistic, and just plain unpleasant in many ways. Powerful forces of nature were attributed to them, as were other facts of daily life. We get diluted mythology stories, but if you get into mythology that is more direct, well, some of that stuff is brutal. Those characters received fanatical devotion, as is seen in Acts 19:28, Acts 17:16-34, and other places. There's no valid comparison of mythology to the Bible, which is written as history. Evolution is an ancient Greek philosophy. (Actually, many Greek philosophies and religious practices were taken from Egypt, India, and other places.) Their false deities are a part of creation and evolution, while God transcends his creation. The Christian needs to realize that what we believe about the one true God and creation are extremely important today. Greek mythology—the story-rich religion of the ancient Greek people—is familiar to most of us today. The names and antics of its gods, demigods, heroes, and assorted mortals enrich our language, art, and culture. 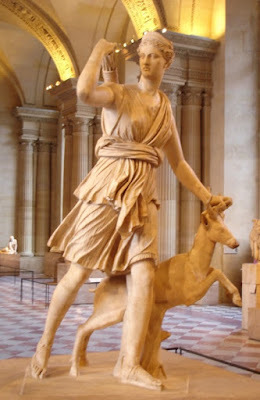 The Apollo space program was named for the Greek god of archery, light, poetry, and music. The entrance to the US Supreme Court building is adorned with Themis the Greek goddess of law and justice, often called by her Roman name Justicia (or Lady Justice). Nashville, Tennessee, the Athens of the South, boasts a full-scale replica of the Parthenon. The original Parthenon, the primary temple of Athena, is in the ancient Greek city Athens, which was named for its patron goddess. Pandora’s box, the Golden Fleece, Achilles’ heel, Zeus’s lightning bolts, Hermes the winged messenger, Prometheus with his gift of fire to man, Titans battling the Olympian gods, the heroic adventures of Heracles (Hercules), the Trojan horse, and Homer’s feuding gods and goddesses—these are just a few images, phrases, and well-known tales drawn from Greek myths and related stories. To read the rest, click on "Greek Mythology and the Gospel of Jesus Christ: What Can We Learn?"